I am not really a heavy drinker now, though that has not always been the case when I was still very young. Through drinking sprees with my friends and our frequent visit to the local bar, I have gained and experienced several drinking games to make the night more exciting for us. These things have enabled us to conjure our very own drinking games ideas and modify popular games that we can call ours. One of the most played in our group is Beer pong. 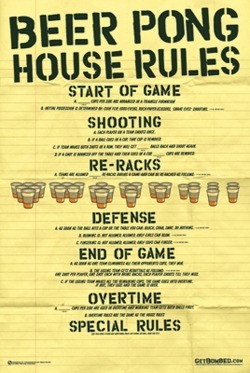 Given that this drinking game is very popular amongst drinkers, we decided to give it a twist. The essence of the game that uses ping pong balls and aiming for the cup is still intact. The only variation we added was instead of forming groups, we decided to play it as a group. Since there are no teams, one is free to shoot his/her ball into any one's drink, which made the game more exciting as ever. The whole group can even gang-up on one friend so that he can get drunk earlier than everyone else. The intensity and the frustration experienced by a player is what made it even more a hit drinking game for us. Another of the drinking games ideas we have involved the game Hi-Lo. This is a drinking card game that is played only by two individuals, which may bore the other if your group is a large one. The thing we did with it was to have every one pick a card and whoever has the lowest number will have to drink the agreed upon amount of drink. This way everyone can join in the party without the need to wait. It can also be a great game if you want to get a friend super drunk that night, as you can connive with your friends to let that person pick a marked card that only you know! After finally getting the hang of playing our version of beer pong on our every drinking get-together, one friend suggested that do our version of Pick Your Poison. 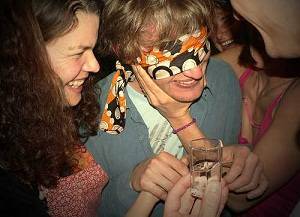 Our version goes by having one blindfolded friend guess what how much drink is another friend holding, i.e. half-glass glass, empty cup or two bottles of beer. It is a more cost effective way rather than line up and spend on various drinks. 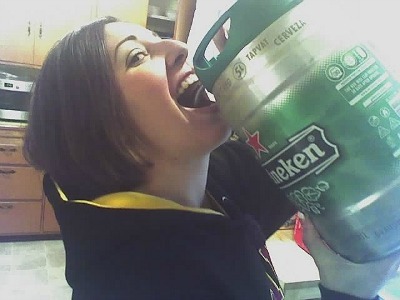 If the guesser gave the wrong answer, he/she will be required to drink that number of drinks held by the other friend. If it is the other way around, the friend holding the drink/s will have to drink them. Due to the number of drinking games common among college students and those found on the Internet, I am sure you and your friends do have a few drinking games ideas of your own. It takes drunkenness, some creativity and a lot of fun to make or modify a game so that your friends and you can enjoy the night in the way that suits all of you best!